With the reassuring protection of an older, avuncular hero, Doctor Who has always fired the imagination of children by sending them on a voyage through space and time to see inaccessible worlds and strange creatures. As the show became more successful, children craved the chance to get up close to the monsters they saw on TV. This was particularly true as Dalekmania gripped the country and ways were devised to put on displays to bring the aliens down to Earth. Although the first permanent Doctor Who exhibitions weren’t set-up until the 1970s, during the 60s a visit to a local fete in the London area would give you a good chance of meeting a Dalek. These props were loaned out either by the BBC or via the original builders of the props themselves, Shawcraft Models. In December 1964 Dalek Two and Dalek Six were on hand at the Daily Mail ‘Boys and Girls’ Exhibition at Olympia in London. The first Dalek movie, Dr. Who and the Daleks (1965), spawned a mini-tour of film Daleks and sets that travelled around various cities in the UK. And in December 1967 a Dalek returned to Olympia again for a second visit to the ‘Boys and Girls’ Exhibition. But these visits were all too brief and towards the end of the 1960s the uncertainty around the future of Doctor Who meant that there were no more major appearances by Daleks or monsters at exhibitions for some time. By the early 1970s Jon Pertwee’s popularity had secured the future of the show and the BBC again became interested in exploiting this renewed popularity. During 1972 the BBC decided to set up a Special Effects exhibition at the Science Museum in London and part of that exhibition was designed to feature the props and monsters most associated with the Special Effects department. By December the exhibition was finished. After passing through a ‘haunted’ barn area, guests would enter the Doctor Who section via an entrance that resembled a Police Box. A mock up of the TARDIS console room could be found inside. 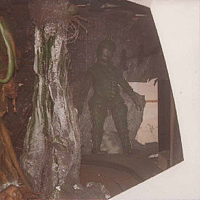 Around the outside of the room were a selection of monsters from the show including an Axon, an Ogron and a Draconian which at the time of opening was yet to be seen on screen. A number of SFX demonstrations and models were also displayed. However, for most, the stars of the exhibition were the Daleks! Even after the mania of the 1960s died down, the series’ most popular monsters had always remained the Daleks and the public appetite to see them was always great. With the production of Planet of the Daleks in full swing, no hero props would be available, therefore new props would have to be created for the event. Charlie Lumm and Tony Oxley1 of the BBC Visual Effects department were tasked with making two new Daleks. They were slightly smaller in stature and the front of the skirt section was more pronounced than that of a TV Dalek but, on the whole, they were extremely accurate replicas. They were made mainly from wood but did have fibreglass dome sections. Oxley was an automation expert and was able to motorise the arm to move, dome and eye to move and pivot and also to make the gun ‘flipper’ protrude and retract. The most recent TV adventure, Day of the Daleks, had featured a gold leader Dalek and grey drones and so Prop One from the Science Museum (which will be termed Dalek SM1) was given a mainly gold livery with silver collars and slats, and black hemispheres. Dalek SM2 didn’t copy the grey scheme and instead was given the classic 1960s livery of all silver with blue hemispheres. Both Daleks looked magnificent, unlike their well worn counterparts that featured on TV. They were given pride of place in the exhibition in a display that simulated a view through the open TARDIS doors, looking out onto an alien planet’s surface. Jon Pertwee, Nicholas Courtney, Katy Manning and John Levine were present at the opening of the display and posed for photos. Jon Pertwee also posed for several photos with just the Dalek props themselves. The exhibition ran until May 1973 and was considered a huge success with over 300,000 people attending2. Lorne Martin, who had overseen the exhibition for BBC Licensing, was asked to create a new BBC Exhibitions department to exploit the commercial value of BBC programme’s in the future. Lord Bath, of the Longleat Estate in Wiltshire, had visited the Science Museum display in its early days and was keen to add something similar at Longleat House. Lord Bath had steadily been turning Longleat into a popular visitor attraction and it was famous for its safari park and lions. He felt a BBC Special Effects display would be the perfect addition to the attractions. After contacting the BBC, a smaller display was setup in the stable blocks behind the house. It was similar to the Science Museum display and also featured a selection of monsters and a smaller scale TARDIS console which had also been made by Tony Oxley. Two Daleks also featured in the display and Lumm and Oxley would again be responsible for creating them. The main hero Daleks were still in use at TV Centre and so the same method was applied as with the Science Museum props, and new Daleks were made. Lord Bath at the opening of the Longleat Exhibition. Click for a larger view. Construction differed in a few small ways: Firstly the iris was of a slightly different design and the eyeball itself more elongated than the original Science Museum prop design. The lights also varied a little and had a black band around the lower edge. The eye pivot slots were smaller and the eyestalk itself sat lower meaning they couldn’t look downwards. The neck section was slightly taller and the fender was given a rubber drape around akin to the TV props, which the Science Museum props had lacked. They were given the same liveries as Dalek SM1 and Dalek SM2. The display opened at Easter 1973 and the Longleat Daleks (or Dalek L1 and Dalek L2) were were big draws for the exhibition. The Science Museum display had been a success and after it closed in May 1973 it was decided to move the exhibition to Middlesbrough to allow fans in the north of the UK to get up close. The display opened in July 1973 and was housed in the Crypt of the Town Hall. The display was basically the same as at the Science Museum but the SFX area had been expanded slightly and some new monsters, including the maggots from The Green Death, were also added to the Doctor Who section. Goon i was stationed at the exit of the console room and some lucky children were allowed to sit in it. Over the months this would take its toll on the prop and eventually the eye and sucker were stolen. The display remained open for six months and at this time BBC decided it would make two new permanent exhibitions based solely on Doctor Who. The Longleat site was perfect and would suit the south of the country and after some searching it was decided that Blackpool would be the location for the northern fans. The Doctor Who exhibition at Blackpool was housed at 111 Central Promenade on the Golden Mile. Blackpool had long been a popular beach resort in the UK and was known for its famous lights. It was the perfect location for the new permanent display. 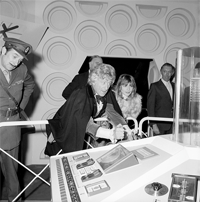 Jon Pertwee and Elisabeth Sladen attended the opening of the exhibition which took place on the 9th April 1974. Huge crowds were drawn to the event and the local papers were given access to record the day. Jon Pertwee was in one of his final promotional appearances as the main star of the show as his final regular appearance as The Doctor was just weeks away. An oversized Police Box replica acted as the entrance for the display and after descending the stairs, visitors came across a dark winding corridor. Set along the sides were displays of monsters and models from the show including Aggedor from The Curse of Peladon and several of the ‘Eight Legs’ from Planet of the Spiders. At the end of the winding corridor was the first Dalek, which was termed ‘Sentinel Dalek.’ This Dalek was the gold Dalek SM1. The prop was set in a plain display but in addition to its motorised movements it was given a voice track played in by hidden speakers. Voiced by Michael Wisher, whom had just voiced Daleks in Death to the Daleks on TV, the Dalek commanded you to stop and explained that the Daleks had captured the TARDIS and that you shouldn’t smoke in the exhibition! Visitors would then pass into the main display area. This featured the console from the Science Museum display at the centre, and set around the outside of this were ‘windows’ in the walls to view the various displays. Under the windows were flashing lights and controls that would activate sounds. The initial displays were mainly made up from the same displays that had been at the Science Museum and Middlesbrough Town Hall. These included the Draconian, an Axon, Alpha Centauri and a Yeti. The final display before exiting the console room was given over to a ‘Dalek Cavern’. Dalek SM2 was stationed here but to make use of the available extra space it was decided that two new Daleks could be added to the setup and that these would be able to move around the display. Again, Lumm and Oxley created these props and again they varied slightly to the previous builds. 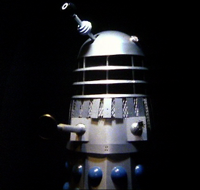 The lights and eyes reverted back to similar designs as the original Dalek SM1 and Dalek SM2, although the iris was of a new, third style and the eyeball slightly smaller. The eye pivot slot was made slightly larger again so the stalk was able to look downwards. The neck section was taller than the Science Museum props and similar in height to the Longleat props. The gun and arm boxes were also slightly wider. They were both given the silver and blue livery although the blue was metallic rather than the standard gloss used on the previous builds. 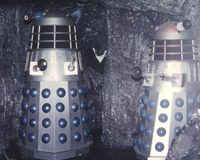 The new Daleks – Dalek Blackpool 1 (or B1) and Dalek Blackpool 2 (or B2) were placed on small ‘trolleys’ that stood on tracks and were able to move around the display that simulated a cave system. To the right of the display Dalek B1 circled around Dalek SM2 and through a hole in the set before reappearing through another hole to circle again. Dalek B2 also circled around and through the set but also around a Silurian that was hiding behind some rocks. Several of the ‘Eight Legs’ also sat on various rocks in the cavern. The two new Daleks seemed to be suffering slightly right from the opening day with several of the hemispheres on both props out of alignment. This was particularly noticeable on the front two panels. The Daleks had another special vocal track also voiced by Michael Wisher. They would ‘scan’ visitors and identify them as the Doctor and attempt to exterminate them but their weaponry would ‘malfunction’. It was at this point the guest could escape with the Daleks shouting that the Doctor was escaping! Over the years the displays would change to reflect the most recent stories and more attention to detail would also be given to them. 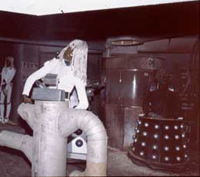 Actual sections of set were used alongside the props to recreate scenes from stories, however the Dalek Cavern remained largely unchanged in the early years. By 1977 the Silurian had been replaced by an Ice Warrior and the Keeler-Krynoid was added, around which Dalek B1 would circle. By 1978 the Ice Warrior had been replaced by a strange Cyberman costume mix of ‘Revenge’ body and ‘Wheel‘ head. The head was replaced in 1979 for the correct ‘Revenge‘ type. The gold Dalek SM1 Sentinel Dalek was now housed in a cave setting of its own too. 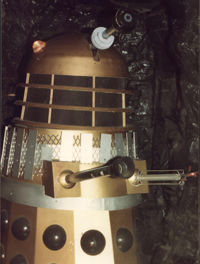 1980 wou ld see the first major change of the Dalek Cavern. Destiny of the Daleks had been transmitted in late 1979 and for the new exhibition season an attempt was made to match the most recent Dalek story. Gone was the cave set with standard walls coming in. The set was dressed with computers and TV monitors and lots of cables and debris to simulate the dilapidated Skaro city. Also in the the set was the complete hero Davros including the proper screen used mask. Two Movellans and one of Romana’s ‘incarnations’ completed the display. Despite the attention to detail in the set design, the Daleks themselves remained in their 1960s silver livery. The TV props had been largely gun metal grey at this time. The only concession to this was that Dalek B2 was given a black lower collar. Dalek B2 now circled some junk on the set whilst Dalek B1 circled Davros and ‘Romana’ and around behind the ‘freezing’ chamber in which Davros had been captured at the end of Destiny of the Daleks. 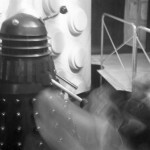 By this time the props had suffered even more and the arms of Dalek B1 and Dalek B2 were sinking back into their boxes. They had also lost telescopic stages and so the suckers were hastily cut off and pushed onto the remaining stage. Dalek SM1 had also lost its sucker by 1980 and a poor plastic replacement was forced onto the arm instead. 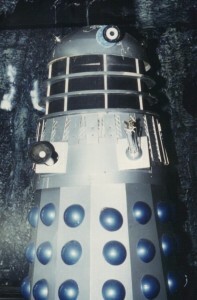 The smaller Dalek set in 1983. Picture – Alan Marshall. Although in 1981 Dalek B2 had its lower collar repainted back to silver, the set remained the same until 1982. At this point the ‘Destiny‘ set was removed and a scene of columns and archways ways brought in. Several costumes from Castrovalva were now seen behind Davros and his three Daleks. 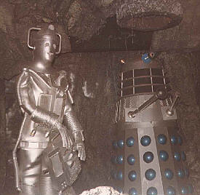 The Dalek Cavern set was reduced in size in 1983. 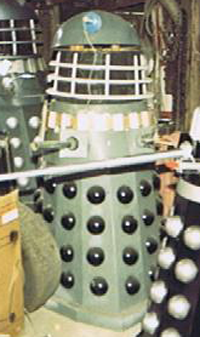 Dalek B1 was removed from its trolley and placed into the rear corner behind Davros, whilst Dalek SM2 was moved up closer to Dalek B2. 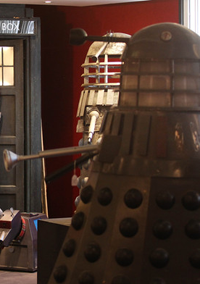 The tracks that Dalek B1 had moved on were removed and a new background set was put in its place which displayed a number of various props and masks. The smaller Dalek set now only allowed to Dalek B2 to circle Davros. After the broadcast of Resurrection of the Daleks in 1984 the set was changed again. Rather fortuitously the background set had been changed to brick walls (replacing the archways) the previous year and resembled the warehouse setting of the recent serial. This time the props were given their first new livery since 1973. They were painted dark grey with black slats and hemispheres to match the onscreen Daleks. However the job was rather hastily done done and black paint splashes could be seen in various places and grey paint was slapped over the neck bins where the cages had been painted in situ! Interestingly, although the Davros chair with the new control panel was used, initially the old ‘Destiny‘ mask remained on the torso of the prop. Dalek SM2 stood next to Dalek B2. 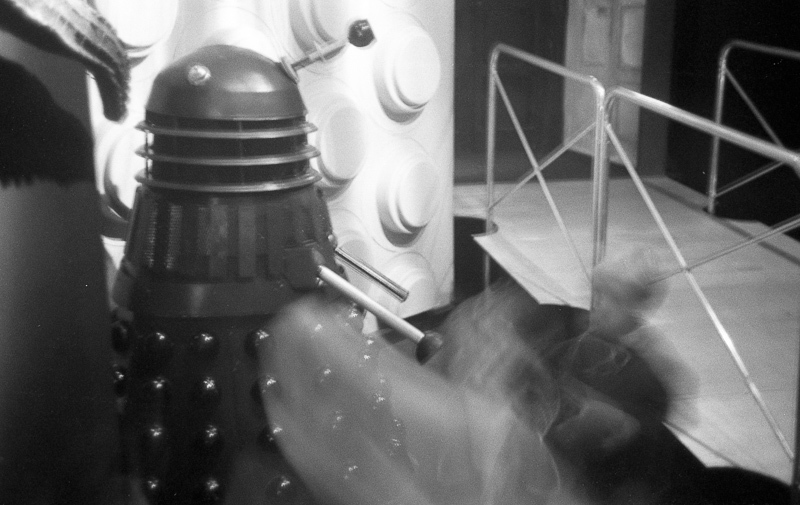 Two of Lytton’s troopers and a screen-used destroyed Dalek made up the numbers. Dalek B1 moved into the same display as Dalek SM1 which itself had moved to the first display at the bottom of the entry steps. The set also resembled a warehouse (complete with a door) and a similar slapdash paint job had also been applied to the two Daleks. Bizarrely, both Daleks hadn’t had their shoulder sections painted and Dalek SM1‘s remained gold whilst Dalek B1‘s remained silver. By 1985 a new Dalek TV serial had been shown – Revelation of the Daleks, and that would mean a change back in the main console room display. The ‘Resurrection‘ display remained largely the same but Dalek SM2 was moved into another bay along with some sets from ‘Revelation‘, the statue of The Doctor and and perspex incubator Dalek. Davros was also now fitted with the new ‘Mark II’ style mask. TV props had been occasional visitors to the exhibition over the years too. 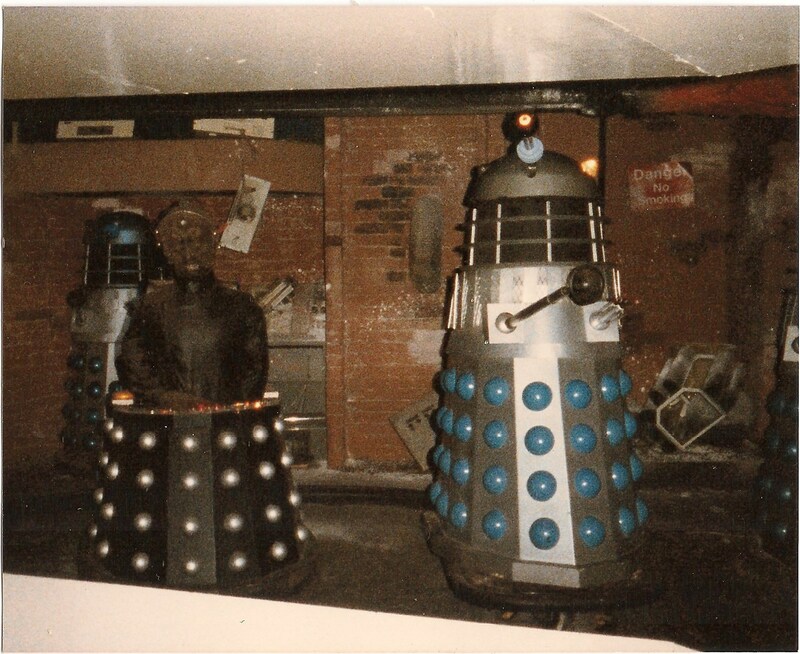 Goon i was present at the opening in 1974 but in 1985 Dalek Six-ex was stationed permanently outside the entrance. Having recently finished use in Revelation of the Daleks it was stood outside in all weathers for holiday makers to have their picture taken with. As a result it suffered from rain, random painting and eager fans taking bits from it. The Blackpool exhibition closed its doors for the last time at the end of the season in 1985 when the lease on the building expired. 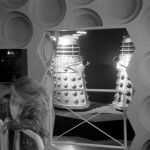 Having housed the BBC SFX display in 1973 which included many Doctor Who elements it was decided that Longleat was the perfect venue to become the second permanent venue for a Doctor Who exhibition. It opened three days after the Blackpool display on 12th April 1974 although without the grand announcement that the Blackpool display had received. 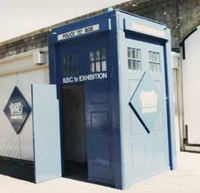 Again under the eye of Lorne Martin, the exhibition followed the same basic pattern of its Blackpool partner with an oversized Police Box as an entrance. A dark winding corridor lead to a central console room around which there were ‘windows’ with buttons and levers for visitors to play with. 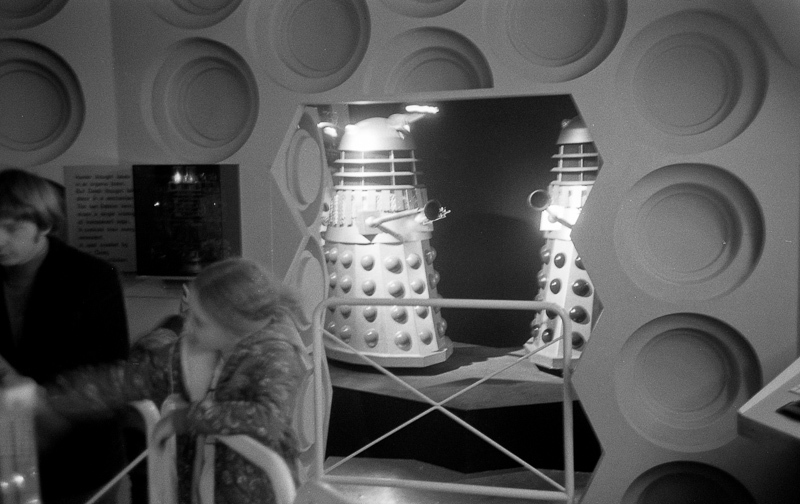 Dalek L2 in the final display before the Console Room in 1975. Click for a larger view. The same two Daleks built for the SFX display the previous year were reused with the silver Dalek L2 selected to become the ‘Sentinel’ Dalek. Dalek L2 had initially been on display in the console room area but had moved to the final display before entering that room to match the ‘Sentinel’ Dalek position at Blackpool. Like Dalek SM1 at Blackpool, it also had a specially recorded vocal track that would welcome visitors to the display but warned them about getting too close to the aliens. It would then take the standard Dalek line about Daleks ruling the universe! 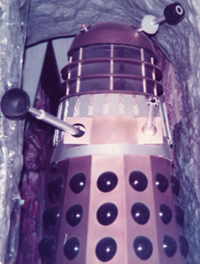 In the late 1970s, Dalek L2 was moved to the very first display case upon entering the exhibition and in early 1980 got a starring role on TV when the exhibition was featured on Blue Peter in a promotional item. Presenter Tina Heath was halted and given a Dalek lecture before helping clean some exhibits and interviewing John Nathan-Turner about the upcoming season. Dalek L1 was positioned in the main console room area although with Longleat being somewhat smaller than Blackpool there generally wasn’t the room for the large sets that could be utilised there. Therefore it was part of a montage of monsters that over the years featured the K1 Robot, Voc Robots, a Fendahl, Time Lords, Eight Legs, Axons, Wirrn and Kralls. 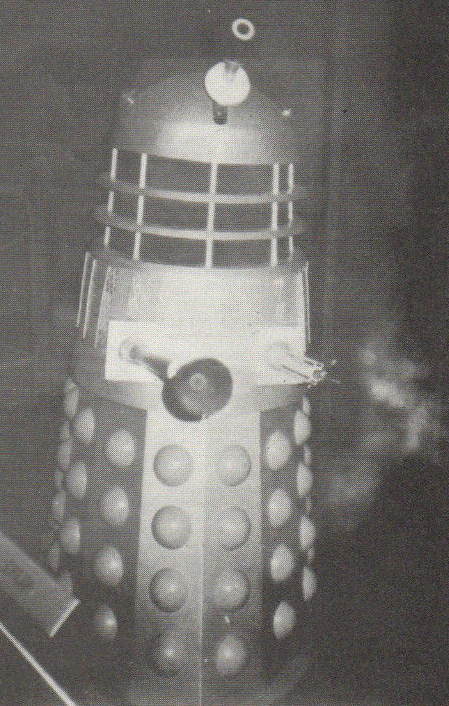 No changes had been made to the props at this time although the pivot ball of the arm of Dalek L1 had been damaged and was now missing. 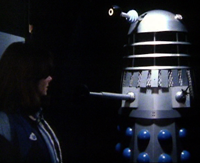 By 1983, Dalek L1 was given a short track to give it a little forward and backwards motion. And with minor changes that’s how the Daleks remained at Longleat until 1987. TV Dalek props also visited Longleat for a period. In 1986 a “BBC Super Shop” was set up in a separate stable block a few yards away from the exhibition itself. This housed a much larger area selling merchandise but also had space to allow extra props from the TV show to be displayed. Dalek N2 and Dalek One-7 were on show here for the season and whilst their exhibition cousins were behind glass, the real TV props were available for the general public to touch and pose with. Unfortunately the 1986 season had seen items stolen from a Sontaran display which prompted a move to greater security for the next year. Martin Wilkie had joined Lorne Martin in the 1980s and together they planned a big revamp to the Longleat exhibition. With the closure of the Blackpool display in 1985, greater resources and time could be given over to Longleat. For security, the displays were fully enclosed behind glass but also greater attention was taken with the displays themselves. New intricate detailing and lights also adorned the corridor leading to the console room. 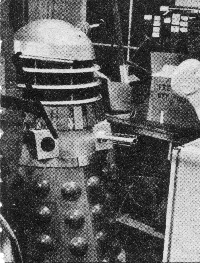 The Dalek props benefited from the changes too and were given pride of place – they occupied the last display position in the console room, just as the Daleks at Blackpool had been. To combat the problem of limited space, a clever trick was employed to make use of an area behind the bay to the left of the Dalek display. A mirror was placed to reflect this hidden area and would trick the viewer into thinking they were looking along a long corridor. Dalek L1 was placed close to the bay window and hidden around the corner were Davros and Dalek L2 which had moved from its ‘Sentinel’ display. The display was named as Revelation of the Daleks, that being the most recent Dalek story, although apart from containing Davros and the Daleks, it didn’t particularly resemble elements from the story. 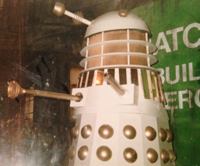 The Daleks themselves remained in their gold and silver liveries whereas the ‘Revelation‘ props had been white or grey. The set was also based on a futuristic white corridor unlike anything seen in the story itself. 1988 would see the final Dalek story of the ‘classic’ series, Remembrance of the Daleks, and the first major change to the props was made at the following season in 1989. The story involved two opposing factions of Daleks. The white and gold Imperial Daleks lead by Davros and the grey and black Daleks termed “Renegades”. With this in mind Dalek L2 was given a grey finish with black slats and hemispheres. It also had its flipper removed from the gun and a light refitted in its place to simulate a laser. Dalek L1 was given a bigger overhaul. Its top collar and slats were removed with the slats being refitted into place on blocks of wood. 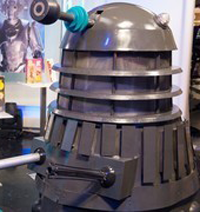 This would give the impression of the new moulded shoulder look that the new Imperial Dalek props had. It was given the new white and gold livery and finished off with the Imperial lights and new arm style. Although Davros did feature in the story his new ‘Emperor’ style prop was was being exhibited at The Space Adventure Exhibit in London. So to complete the set the ‘hero’ exploded Dalek from the story was used. The whole set was dressed to appear as if it was Ratcliffe’s Builders Merchants complete with large green gate. 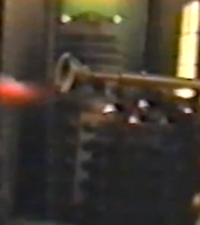 In 1991 the impressive Special Weapons Dalek was added to the display for a short time with the exploded Dalek moving to the front of the set. The Special Weapons Dalek had also been at The Space Adventure the previous year and had been motorised so that its gun would move up and down. 1994 would see the next major change to the display. With the original run of the series seemingly over there was no need to represent the sets of the latest stories and so older monsters started to make a return to the displays. It was decided to give the Daleks a colour scheme more more familiar to the public, and so Dalek L1 was painted to a gun metal grey with black hemispheres although it retained its ‘Remembrance‘ arm. Dalek L2 was removed from the exhibition completely and placed in storage. The original Davros chair and dummy torso returned although the set remained largely as a street/yard scene. In 1995 it was decided to make the display more dynamic, and a further trick was used. The set was reconfigured to become a high-tech corridor, and a fine gauze was placed in front of the mirror which obscured Davros. Then, when the lighting changed, Davros would appear at the back of the set. It was an impressive and imaginative set. Disaster struck at the exhibition in 1996. Most of the year had passed without incident but on 25th September a fire broke out when the internal workings of the K-9 prop caught alight. Luckily not a massive amount of damage was done to the exhibits themselves although several of the props including the Nucleus of the Swarm from The Invisible Enemy, the Android from The Visitation and a Robot Cleaner from Paradise Towers were beyond repair. Most of the issues were down to heat and smoke damage with the plastic sections melting in the bays and the main structure taking the brunt. 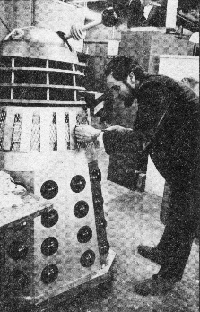 However as the Dalek props and central console unit were made largely from wood they were left relatively untouched with only some of the slats coming away from the shoulders of Dalek L1. The Daleks had not been defeated! The race was on to get everything back up and running for the new season in 1997. With the main roof and structure repaired, work began on the inside. Barring the US-made TV Movie starring Paul McGann, the show had been off the air for some eight years. The Daleks had only featured vocally in the TV Movie and they were possibly beginning to lose some of the draw they once had with the general public. The younger generation weren’t aware of just how popular these monsters had been and so there was no impetus to devote the final space in the exhibition to them. The Daleks’ new location would instead be at the end of the first corridor. 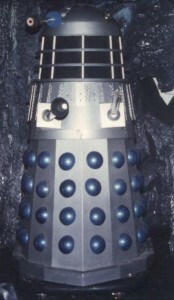 Dalek L1 was given some refurbishment although retained its classic grey and black finish. A refurbished Davros also stood in the smaller display and for the first time at Lonlgeat, Davros’ Emperor chair from Remembrance of the Daleks made an appearance. Also in the display was a rather good replica of Dalek One-7 made by fan and occasional employee of the exhibition, Mark Barton Hill. Another Dalek of Mark’s was often to be seen in a separate display or trundling around the estate too. To make up for the lack of size of the display, a “speak like a Dalek” microphone was added next to the window where fans could shout away to their heart’s content! The Longleat exhibition finally closed its doors in 2003 when Longleat decided they wanted to refresh the attractions across the site. With the closure of the Blackpool Exhibition a number of the non-TV used props fell into the possession of Martin Wilkie and Lorne Martin. These included the four Daleks. 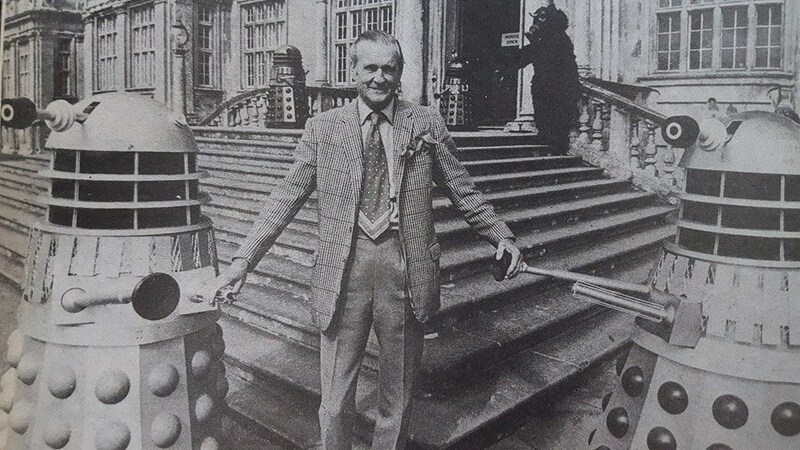 Wilkie and Martin worked closely with BBC Enterprises and with the BBC keen to promote Doctor Who in other countries the chance was taken to use one of the Daleks as a publicity tool in Australia. Martin Wilkie is the son of veteran BBC SFX expert Bernard Wilkie and was an accomplished designer of his own and he gave Dalek SM2 an overhaul which included a full repaint back to mainly silver but this time with black hemispheres. The iris was changed and the discs were repositioned to the centre of the eyestalk. It had been a quirk of all the exhibition props that the discs had been positioned too close to the pivot. 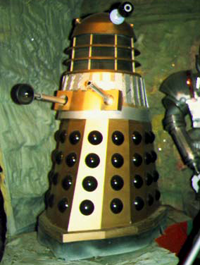 This Dalek was sent to the Australian arm of BBC Enterprises soon after the closure of the Blackpool display in 1985 and used to promote the show. It has been seen at the ‘SPFX: Secrets Behind the Screen’ exhibition at the Powerhouse in 1995 and at the Doctor Who Exhibition at the ABC Centre in Ultimo, Sydney in 2013. In June 1986 the BBC radio show Women’s Hour had teamed up with the Red Cross to raise money for Sudan and Christie’s in London were holding an auction of various items donated by famous personalities and organisations. Dalek Six-ex was being donated by the BBC and was expected to raise in excess of £3000. 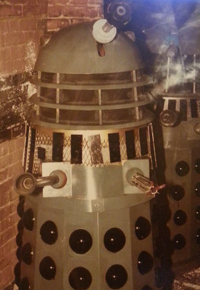 Wilkie had taken the rather dilapidated prop after it had been stood outside the Blackpool exhibition for the final 1985 season and embellished it with the neck cage and eye from Dalek B1 as well as giving it a complete new light grey livery. In 1987 BBC Enterprises in the UK were looking for a prop of their own to help promote the show and sales of VHS tapes of Doctor Who. They again tasked Wilkie to produce the Dalek. He had access to Dalek N2 which was itself looking a little shabby after spending a season in the Longleat ‘BBC Super Shop’. Dalek B2 was cannibalised for parts with the smaller eyeball, neck cage and gun all swapped to Dalek N2 with the whole prop given a smart black and silver livery. Wilkie and Martin also had in their possession the Daleks that had been at the International Garden Festival display in Liverpool in 1984. These had also been made at the BBC but were classed as Exhibition props at the time and therefore not returned to the BBC stores. 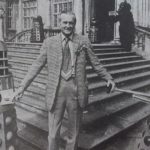 However, the close links between Martin Wilkie, Lorne Martin and the BBC meant that when the Special Effects department were finding props for Remembrance of the Daleks in 1988, the exhibition props that were held by Wilkie and Martin came in very useful. A shoulder section of one of the grey Liverpool Daleks and the neck bin of Dalek SM1 was given to make help complete Renegade Dalek N5. 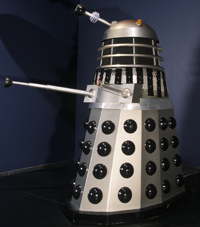 The promotional Dalek they had created in 1987 from Dalek N2 was also drafted in and acted as the Supreme Dalek. 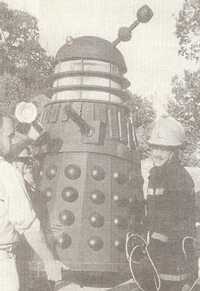 Once it left the Longleat display in the late early 1990s, Dalek L2 had gone into storage but was not forgotten. 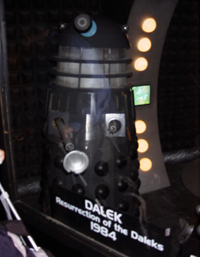 The Museum of Moving Image had held a Doctor Who exhibition in the early 1990s but retained a Dalek presence for some years after the main display left. 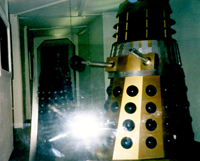 Dalek L2 had a spell at the exhibition in the late 90s. 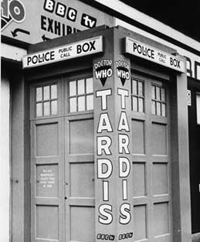 Having been deemed to have outlived its use for the BBC, the prop was sold to the ‘Weird and Wonderful’ prop hire company based at Elstree studios and by 2002 it was on display at Planet Hollywood in London. In 2005 it appeared on the cover of The Guardian’s TV guide which was promoting the return of Doctor Who and had been painted black and silver at some time before the shoot. It next surfaced In 2008, in Peterborough and it has most recently been seen at the Moveum on the Southbank and been given an overhaul so that it resembled a Dalek from the 1960s movies. Unfortunately it was labelled with the information that is was a genuine prop from one of the films! The story of Doctor Who in Blackpool didn’t quite end in 1985. To coincide with the news that the show was returning to TV, a new exhibition was opened in 2004 at the Golden Mile Centre. 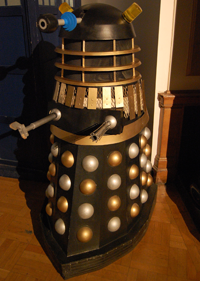 Many of the exhibits from Longleat were reused including the central console and of course, Dalek L1. It remained in its grey finish and was situated in a large Dalek themed area that also included Davros, the exploded Dalek, The Emperor prop and Dalek N1. Unfortunately the display didn’t last as long as the original and the exhibition closed in November 2009. Soon after it was felt many of the exhibits had had their time and a large sale of props was therefore held at Bonhams in 2010. When Dalek L1 came up for auction it fetched £900. It was re-auctioned again in 2013 and is now in the collection of Peter Trott who also had the Longleat console. It also had its own starring moment on TV in 2013 when it featured on ITV’s This Morning show in an article about the 50th anniversary of Doctor Who. More than forty years after their first appearance at the Science Museum and Longleat, Dalek SM2 and Daleks L1 and L2 are still going strong today. For many, these Dalek props are just as important as their TV used cousins and represent an era of organised Doctor Who fandom at its birth!